Composition covers are made from a heavy (17pt.) 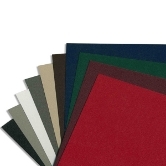 latex coated paper with an embossed grain pattern. They are available in many colors and sizes. Windows are available as an option. Letter, legal, and tabloid/ledger sizes are in stock. Call us for other sizes, including custom sizes. Composition covers are sold in packs of 100. 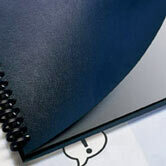 We can also provide composition covers customized with your name, logo, or title. Call us today for a quote. Special Colors Available in 8 1/2" x 14" or 11" x 17" are available as custom orders only. Call 1-800-808-2377 for a quote.